Fall is in full swing and by now, most people have indulged in a pumpkin flavored something or other. Pumpkin is all the buzz during the season, but my favorite produce of the season is pomegranate. These seeds pack serious nutritional benefits. This super fruit is rich in fiber, folate, and Vitamins C and K. A full pomegranate will provide you will half the daily about of Vitamin C and over half for Vitamin K. It’s low in sodium, cholesterol, and saturated fat. 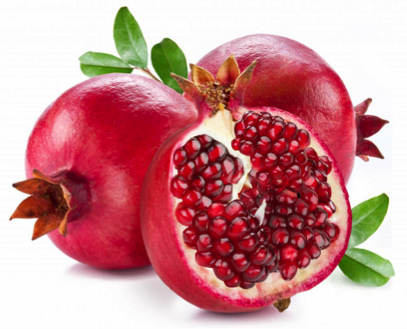 Pomegranates also have a surprisingly good amount of potassium, even more than a medium banana! What you can’t see on the nutrition label is the amount of antioxidants it contains. Flavonoids are antioxidants understood to neutralize cancer causing toxins. In addition, polyphenols have been proven to have a role in the prevention of degenerative diseases, particularly cardiovascular diseases and cancers. These seeds truly pack a punch and are a delicious addition to a salad or just to eat on their own. Here is a recipe for an antioxidant smoothie including pomegranate! ½ cup 100% pomegranate juice (make sure there is no added sugar! These suckers are a little more time consuming than your typical fruit. Deseeding can take a while, but this method seems to work best. Think about all the nutrients you will be consuming after the hard work is done! First, wash the fruit thoroughly. The dirt and bacteria on the outside will be dragged through the fruit by the knife thus leading to consumption. After it is washed, cut it in half on the equator. Put on half in your palm over an empty bowl. Hit the back of the pomegranate with a wooden spoon or spatula until the seeds fall out through your fingers. That way the fleshy white part will be separated from the seeds. Repeat with the other half and enjoy your bowl of antioxidants!